Thunderbird can not import a .pst or .ost file. Most import tools, and Thunderbird, require that a compatible version of Outlook be installed on the PC being used to import Microsoft Outlook Data Files. In order to import messages from Outlook to Thunderbird, Outlook must be the default mail client. Mail import from Outlook works by using the Outlook program to source the emails, not the underlying .pst file. Note that Thunderbird is a 32-bit program, so it can't import from a 64-bit version of Outlook. Want to convert your emails from Microsoft Outlook to Thunderbird? 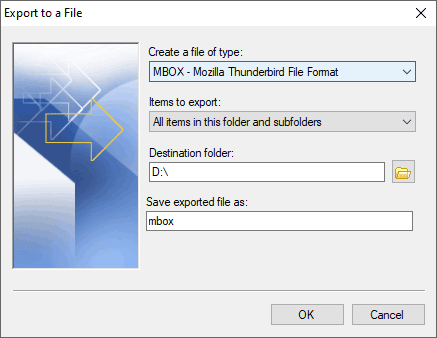 If you are switching to Thunderbird and will no longer have access to Outlook, here we will guide you through the process transferring your .pst and .ost files to Thunderbird. Outlook will store your .pst and .ost files somewhere in the application data folder for your Windows user: see the Microsoft Office site for the locations for Outlook 2007, Outlook 2010, and Outlook 2013 for example. You will probably have at least two mail files, both of which will need to be imported into Thunderbird. Whether they are in PST (outlook.pst, archive.pst) or OST (outlook.ost) format depends on what type of mail server and which version of Outlook you are using. Download and install PST Walker. Launch PST Walker and select .pst or .ost file to open. Next click the File->Export menu to convert .pst/.ost file to mbox files. Launch Thunderbird. Right click on "Local Folders" and select "Settings". Now you can see "Local directory" for your "Account Settings". Quit Thunderbird. Navigate to your "Local Folders" directory in an explorer and drag and drop your mbox files in there. Restart Thunderbird, and you should see the mailbox in your Local Folders list.